Biography: As a child, Ninon Pelletier wanted to become an astronaut in order to see the world differently. Instead, thanks to her great imagination, she became an illustrator. She studied photography and graphic design, and has illustrated over thirty children's books. She was nominated for the Governor General's Literary Award in 2016. She lives in Montreal, Quebec, surrounded by her pencils, charcoals and friends. For more information, visit ninonpelletier.blogspot.com. 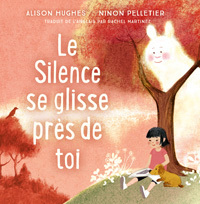 Il faut parfois de l’aide pour trouver le Silence. Why can't Night ever find his big sister Day?